Part of revering nature is to respect all the people who share the planet with it. Thus, the right dentist will always be concerned about how certain methods of care will impact your overall health. An example of this expression is the approach taken to capturing X-Ray images. In times past, the only way to have X-Ray photos taken was to undergo the traditional process, which exposed patients to higher amounts of radiation. With the breakthroughs in dentistry, though, you can now have digital X-Rays taken, which typically decrease the radiation exposure by as much as 90%. The environment benefits as well from everything being done digitally. Taking this route also eliminates the need for harsh chemicals or paper to store files. Instead, all the pertinent information is maintained and transmitted by means of computer technology. 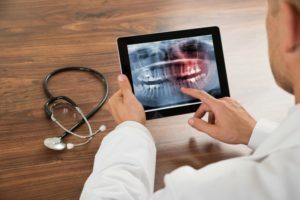 Along with using digital means to store and transmit information, the staff at Dentistry in Buckhead also take special measures to prevent any waste. Thus, such recyclables as paper, plastic, glass, batteries and cardboard are carefully collected and sent to a local recycling center. As another example of the emphasis placed on delivering green care, records and claim files are all digitally managed. While electronic file management is a great way to support the environment, there can be electronic waste accumulation over time. Ignored, this can pose a health danger from the carcinogen-causing chemicals that can leak into the ground water supply. To prevent this from happening, a responsible practice will carefully dispose of all electronic devices and waste. Who Takes This Type of Approach to Dentistry? Dr. Peter A. Pate and his staff at Dentistry in Buckhead have committed themselves to being responsible about how they affect and coexist with the environment. Thus, while maintaining the highest standards for dental care, they are equally driven to make sure the world we live in is safe for everyone. When you pay them a visit, you’ll soon find out there is more to dentistry than just receiving routine care. By working with the professionals at Dentistry in Buckhead, you’ll feel like you’ve taken a stance to protect “Mother Nature” as well. To experience the euphoria of protecting your mouth, teeth and gums in an environmentally-conscious way, reach out to a staff member to schedule your first eco-friendly visit today! Dr. Peter A. Pate earned his dental degree from the University of Tennessee School of Dentistry. He has since gone on to provide the best in dental care for nearly 40 years. Still, Dr. Pate remains eager to learn more, which is why he has taken hundreds of hours of continuing education, which includes advanced training from the world-renowned Pankey Institute. He provides patients with top-notch care in an environmentally-sound manner at Dentistry in Buckhead, and he can be reached for more information through his website.